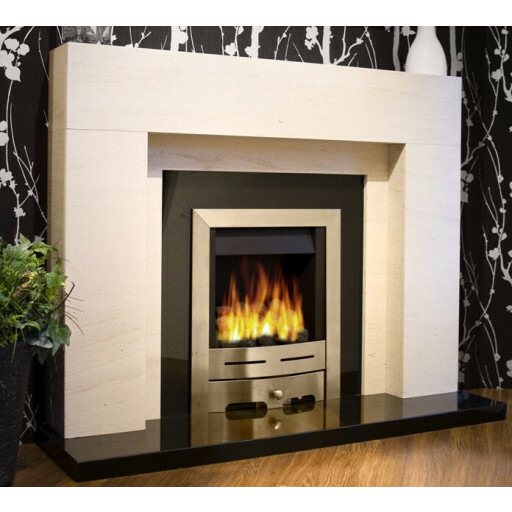 The Lister is a contemporary fireplace that is a contemporary, clean-lined and modern designed fireplace which makes it perfect product to compliment the décor of any room. This elegant, versatile fireplace is crafted from solid Portuguese limestone, one of the most durable fire-resistant materials available on the market. The limestone will resist smoke discoloration over time, helping to keep the Lister fireplace looking as good as new for years to come. Limestone is a highly valued material in the construction of high quality fireplaces due to its beauty, versatility, and most of all its longevity.The Lister's hearth is composed of the highest quality black granite, which will resist scratches, scuffs, and stains. The reflective quality of the polished black granite enhances the light produced by the fire, creating an enhanced ambience and glow. The Lister fireplace's standard dimensions mean that it is a versatile fireplace that can be the perfect product of choice for homes of any size. Lister's stylish, monochromatic design can become the perfect focal point of homes both old and new. This simple, elegant, high quality fireplace will lend a timeless, sophisticated feel to any room. It was the combination of limestone and black marble that sold this fireplace to us, perfect for our new colour scheme, we got it fitted last week by DMT FITTERS and they did a fab job...we love it!!!!! Just had one fitted yesterday. Sleek, modern looking fireplace that will be the focal point of the room without being flashy or "loud". We love it.